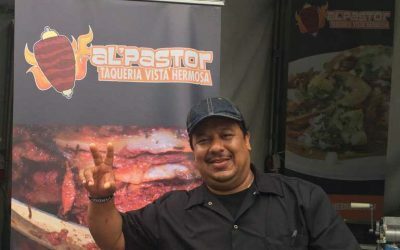 Raul Morales is the recipient of a multi-generation recipe and tradition for “Tacos Al Pastor”. 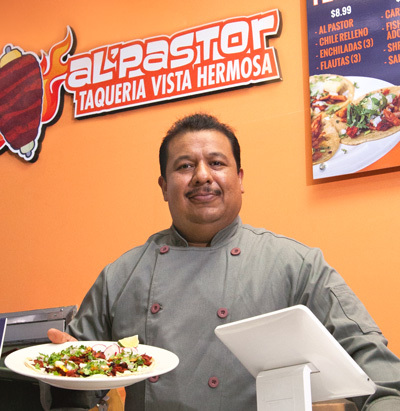 He represents the 3rd generation making the acclaimed Tacos Al Pastor. Born and raised in Michoacan,one of the most culinary diverse states in Mexico. Today, Raul proudly embraces his youth as an apprentice of the taco trade thru his uncle’s street cart of tacos al pastor. Raul often daydreams of those days when he would spend long hours setting up the “trompo” with the marinated meat. (Trompo: long spit where the thin strips of spice-marinated meat are stacked onto for grilling.) This was an art and a skill. He made sure that every layer of meat had the right amount of spices and marinade and was pressured correctly so it would cook evenly and to perfection. Tacos al pastor (Shepherd’s Tacos)—thin slices of pork shaved from a giant tower of layered meat rotating on a spit beside an open grill, piled onto one or two soft tortillas and topped with onions, chopped cilantro, a spear or chunks of pineapple, and a dollop of salsa. Giant flour tortilla, choice of meat, Mexican rice, beans, freshly minced cilantro and onion, salsa side. (RED/GREEN) Same greatness of a burrito smothered with green tomatillo or red mild sauce, cream and cheese. Mexican bread sandwich, choice of meat, beans, cream, queso fresco, tomato, lettuce, jalapeños. Giant flour tortilla grilled with cheese, topped with veggies & avocado. Crisp corn tortilla filled with meat or veggies topped with tomato, cheese, guacamole and cheese. an open flame rotating broiler. on the grill, Mexican style. Sautéed Poblano pepper, corn, tomato, with cream and cheese. Taqueria Vista Hermosa is proud to serve Authentic Mexican Food featuring the specialty Tacos Al Pastor. We offer lots of delicious options for hosting parties or events of any size. All of our dishes are prepared on site with fresh ingredients, served warm, and presented in the most professional and authentic possible way. Event Types: Weddings, private parties, events, corporate meetings, b-day parties, expos. Menu Types: Custom menus to fit your needs. We had an amazing time at LA Weekly's 2016 Tacolandia event. Follow the link to see our pictures. We've updated our image! Thanks to our fans and family for all your support. 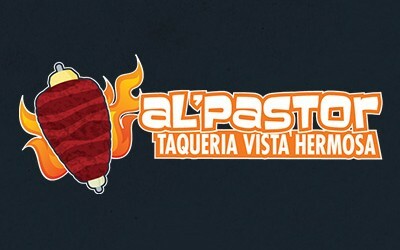 Come try our famous Al’Pastor meals!